Mike Anderson is a software engineer at MakeMusic where he works his programming magic on both the SmartMusic application and the SmartMusic websites. In addition to being an experienced programmer, Mike brings a deep music background and a great sense of humor to work every day. 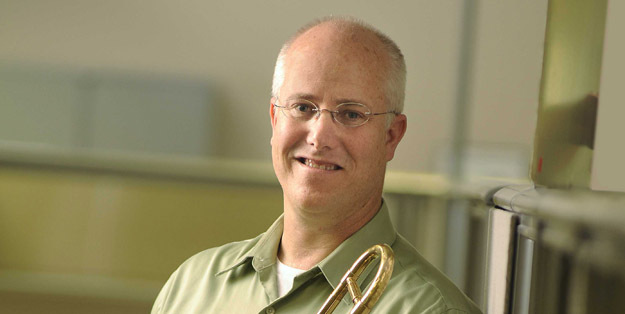 James Lund: What instruments do you play? Mike Anderson: Saxophone, and a bit of flute and clarinet. What had you done professionally prior to joining MakeMusic? I spent twelve years in the Air Force Band. For six years I was stationed at the Chanute Air Force Base in Illinois where we supported the recruitment effort by playing at high schools throughout a five-state area. I met many band directors and music students during that time. The last six years I was stationed in Germany, performing all around Europe in the United States Air Forces in Europe (USAFE) Band. I also spent ten years as a C++ programmer at Bankers Systems, which became Wolters Kluwer. What sorts of music gigs do you do today outside of MakeMusic? I play a few gigs a year with the Great River Jazz Collective big band; most Monday nights I’m at “Monday Night Jazz” at the Veranda in St. Cloud; I occasionally do theater productions (including a recent run of Jesus Christ Superstar) where I may play sax, clarinet, and flute; and I’ll also occasionally play with George Maurer – who has an annual holiday show (this year on December 22nd) at the Dakota (Minneapolis’ premier jazz club). Got an Air Force Band story for us? One of the most memorable concerts I played was in 1990 at Pilsen, Czech Republic. When I first arrived in Germany to play in the USAF band in Europe there was no slot for a saxophone player in the Jazz Band. I was put into the concert band playing clarinet and I was less than thrilled about it. However, many things were happening in Europe in 1990, including the fall of the Berlin Wall and the opening of the east. The concert band was sent to Pilsen to help celebrate the liberation of Pilsen by the American Army, the first time this was allowed since 1945! Previously the citizens were only allowed to celebrate the Soviet liberation of the city. We played to a huge crowd and the emotions were evident from the first song we played; many people cried as they sang the U.S. and then the Czech national anthems. After the concert the band was swamped with people eager to thank us and talk. My roommate and I were led around the city to many small parties and we met tons of wonderful people. It was eye-opening to see that the events of WWII still had such an impact. Being able to tour the Pilsen brewery the next day only added to the fun! I know you’re also a SmartMusic user. Do you have a favorite SmartMusic piece? I like the play-by-ear “Blues Licks” exercises. I also like the “Wynton Marsalis Volume III: Standards.” When I first joined the Air Force Band a lot of the musicians practiced with the Aebersold play-along CDs and I learned a lot by listening to them and improvising myself. The big problem was that the tempos were not flexible. Some were too fast, while others weren’t fast enough. SmartMusic play-along titles have a huge advantage in that you can adjust the tempos! You can also change the keys. Nothing is better for memorizing and really learning songs then playing them in all 12 keys. I don’t know if you’re familiar with “Mr. Big Ears” but he’s got the super power I’ve always wanted. He can hear any sequence of notes and instantly play them back on his instrument. He also recognizes chord qualities instantly. Good luck with that! I have one final question: Why are you holding a trombone in the employee photograph taken last year? I left my saxophone at home that day, and had to hold something. Good thing I always keep a trombone in my trunk for just this sort of emergency!